Whenever we see bedraggled little children begging or selling wares in the streets, markets, and bus and train stations, our first reaction is not to take any responsibility for them. Understandably, it is not within the means of most ordinary people to do much and the onus is usually on nongovernmental organisations to take up the challenge of providing these children with the opportunity of a better life. One often wonders how these children survive on the streets and how many make it to adulthood without succumbing to violence or disease. One wonders about the evolution of some of the fortunate ones who have received sanctuary in time. Amin Sheikh is one of those little children who lived an extraordinary life that would eventually take this young man from being a beggar in Bombay to a stature that would land him in Barcelona. Amin Sheikh’s life was brought to the stage by Communicare Trust, an NGO in Goa that focuses on adding to people’s linguistic skills and works with underprivileged children, helping them to learn through various artistic media. The cast of the play Bombay to Barcelona had boys from Margaret Bosco Bal Sadan (Bastora, Mapusa) playing pivotal roles. The decision to have these children, who have no doubt experienced much the same of life as Amin, was pertinent. The boys performed well and displayed the confidence and improved language skills that Communicare Trust hopes to encourage through its annual multilingual play (in this case it was Hindi, English and Spanish). 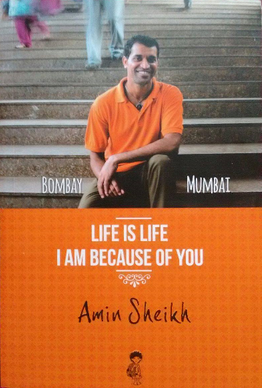 While the play had its own delights in being a succinct and well-played out narrative, the book that it is based on, Amin’s autobiography titled Bombay Mumbai: Life is Life: I am because of you, leaves you shaken by the cruelty he encountered and moved to tears by the love that saved his life and, more importantly, his soul. At the beginning of his book, Amin makes the purpose of his literary endeavour clear. The sole purpose of this book was to collect enough money to open a solitary library café ‘Bombay to Barcelona’, which employs the boys and girls from his beloved Snehasadan. The project is supported by the NGO Soy Gracias A Ti. Amin’s life has made him a compassionate person with concern for the environment, inequality, and the state of medical care in India’s rural areas. Ever one to treasure dreams, he hopes that his café will do well and allow him to have ambulances running throughout India for the use of the village people who usually lack the minimum of healthcare. With the candour of a child, Amin relates his life story which began in Mumbai on the 24th of June 1980. An unhappy family life included his mother leaving his father for another man and incessant physical abuse from the ‘stepfather’. Amin ran away from home numerous times, finding himself begging in the streets and stations. He was sexually abused there and constantly tried to find ways to escape the older and stronger boys. He was taken home by people who pretended to pity him but only did so to be able to exploit him. A man he calls ‘Mama’ (uncle) restored his faith in humanity to some extent when he took care of him without an ulterior motive. When he was reunited with his mother the first time, there was temporary relief but life at home would not change so easily. When Amin ran away from home for the umpteenth time, his sister Sabira followed him too. Her situation was far more precarious then his and it was difficult to protect her from perverse men. Their guardian angel arrived in the form of Sr Seraphine from Snehasadan, an organisation that has sheltered and trained homeless children in Mumbai for 50 years. Amin recounts the love and understanding shown to him by Fr Placido Fonseca, Sr Seraphine, Tina Guido, Br Molines and others. Though he had his share of escapades here too, it was the guiding influence of these individuals that kept him from the point of no return. A special chapter in the book is connected with the 1992 Mumbai riots that saw Hindus and Muslims take up arms against each other. Amin, a Muslim, points out the secular environment of his home in Snehasadan and how his employer, Arun Bhai, a Hindu for whom Amin used to deliver newspapers, agreed to protect him if confronted by a gang of Hindu rioters. Amin comments on the futility of religious violence and that the Ayodhya dispute (demolition of the Babri Masjid) should have been settled by building a garden where they could not decide on a temple or a mosque. Even building a hospital in the area would make more sense than destroying precious lives over religious differences. It was after Amin took up working for Eustace Fernandes that his life changed for the better beyond anything he had ever hoped for. Eventually he managed to set up his tourist care service Sneha Travels Tourist Company and have his own home called New Amore. He learnt more about life and kindness from Eustace, Eustace’s friends, Mary D’Souza (Eustace’s cook), and Sahir D’Souza, the boy who urged Amin to record his story. How did Amin get to Barcelona? Well, you will have to read the book to find that out. 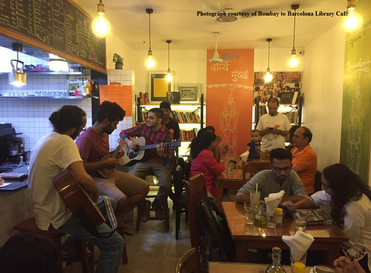 Remember, all proceeds of the book sales go towards sustaining the library café Bombay to Barcelona. You could be helping in your own way to change the lives of many Amins who deserve a chance to thrive. 3 and 4 Golden Nest Co-op.